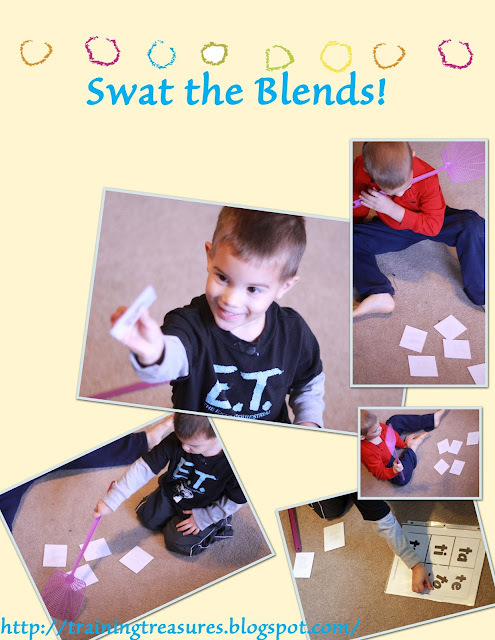 Training Treasures: Swat the Blends! up. Okay, two things, one of which I already shared in my previous post, Paw Print Blend Matching, and these phonetic blend charts from Blessed Beyond a Doubt. quickly, but is highly effective. Matching the cards to the chart. After a few days of independently working the matching games, my 2-year-old had had enough! I then put the charts on the ground during our circle time, including his older brother (who has been reading for over 2 years) to play for a bit of competition. However, this time I added a flyswatter- my personal favorite manipulative! I flipped the cards over, and they picked which one to swat and read. My oldest read right through the cards, and loved to tell his brother which blend to pick. To avoid this, just print on the white side of scrapbook paper. But no matter, the game gives lots of practice! After they picked a blend and read it, they put it on the phonetic chart. When the entire chart was complete, I called out blends and they brought them to me to put away. They read and heard each blend at least three times, although I repeated each blend too. 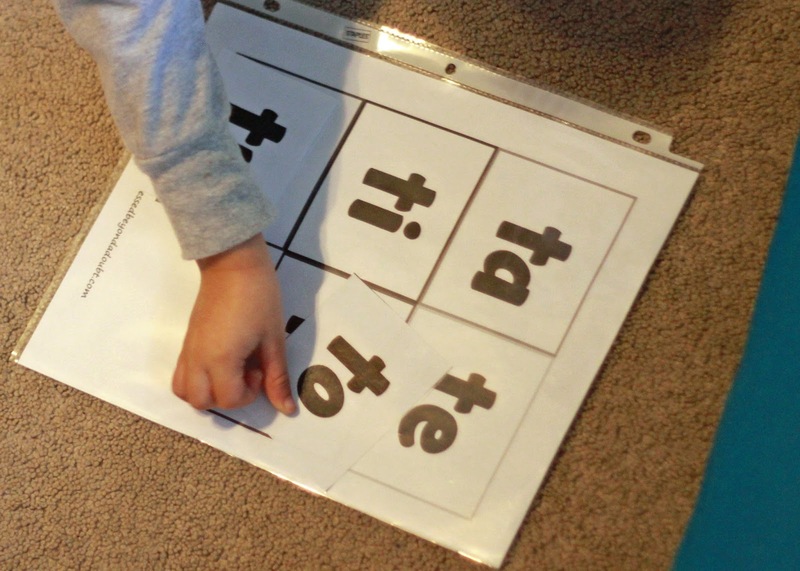 Print two copies of the phonetic charts. Laminate one copy. Insert the other into a page protector. Cut laminated chart into squares. Flip cards over. Child swats blend of choice, reads blend, and places on top of its match on phonetic chart. After all cards have been placed on chart, call out a blend for your child to bring to you, having them read it as they put it away. Don't have a flyswatter? I have also used a "magic wand" (a dowel rod), and had my child say, "Bippity, Boppity, Boo!" before continuing play the same way.